This is a small but eclectic mix of items I've had in storage. Some items I was always (until now) reluctant to sell. Others were too difficult to display well at the record fairs I did across Europe and the U.K. As a result, they were largely forgotten. A few others originally hung in my house in Scotland but are not suited to the one I now have in France. 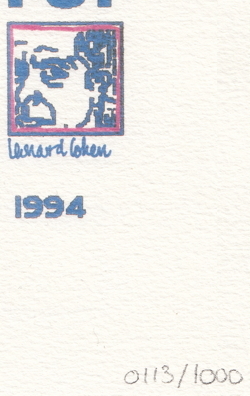 Please note: due to storage conditions for the last 25 years, there may be some light foxing to edges and margins. This is unavoidable when items were constantly moved to and from fairs and than stored without temperature control.All prices quoted include UK first class postage or courier delivery. 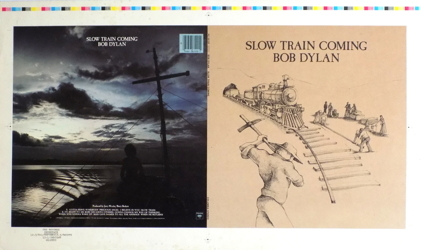 Bob Dylan Extremely rare uncut printer's proof for the 1979 album, "Slow Train Coming". Overall size 690mm x 410mm. 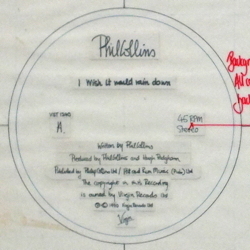 The Cure Rare uncut printer's proof for the 1985 10" limited edition of "Half An Octopuss". Overall size 650mm x 380mm. 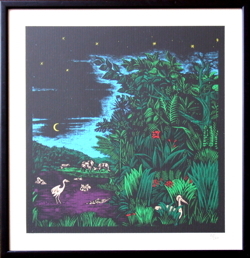 Very Rare Fleetwood Mac promotional numbered limited edition print of the artwork for the 1987 album, "Tango In The Night". This is number 38 of a run of only 100. The original, known as "Homage a Henri Rosseau", is by Australian artist Brett Livingstone-Strong and hung in Lindsey Buckingham's home. For 27 years, this hung on one of my walls before going into storage. 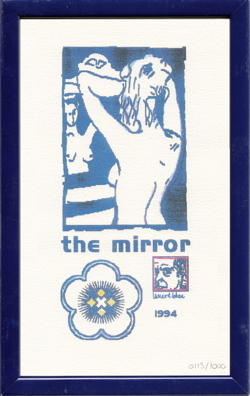 Extremely Rare Leonard Cohen framed and glazed numbered limited edition print of the artwork for "The Mirror". 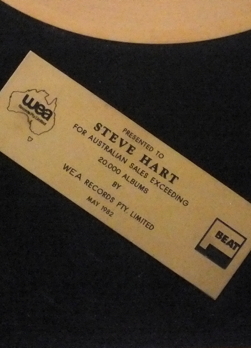 I bought this at a record fair at Espace Champerret, Paris in early 1995. It was implied at the time that it had been sold by FNAC but that may have been incorrect. Since then, I've never been able to find another for sale. The only mention I can find of it on the internet is here. Size 171mm x 271mm. 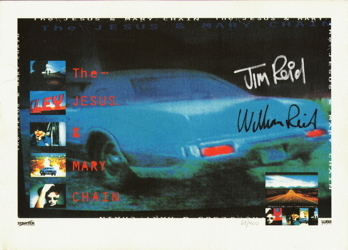 Rare Jesus And Mary Chain autographed promotional print for the 1994. album, "Stoned & Dethroned". Size 420mm x 295mm. 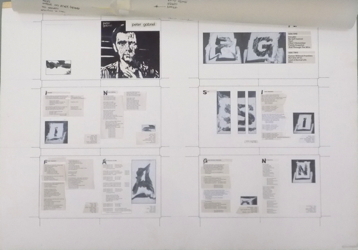 Peter Gabriel artwork/layout for the CD booklet for his 1980 album, "Peter Gabriel". 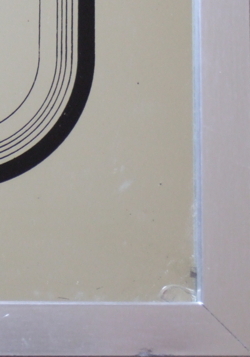 The layout comes with bottom paste-up layer (pictured on the right) and attached top layer (seen in place on the left) with instructions for the printers. Protective card cover sheet has been re-attached with masking tape as it had been. 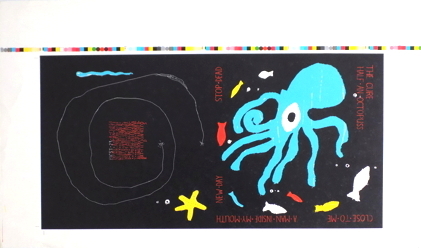 There is a void on the cover sheet which obviously carried the design studio label. This was removed before it was sold to me. Size 730mm X 510mm. 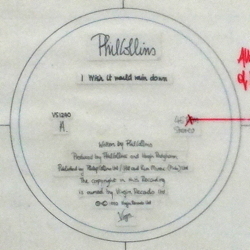 Phil Collins artwork/layout for the 7" labels for the 1989 E.P., "I Wish It Would Rain Down". 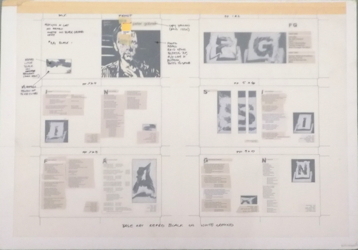 The layout comes with bottom paste-up layer and attached top layer with instructions for the printers. 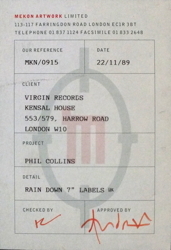 Protective card cover sheet carries a Mekon Artwork label (pictured on the right above) detailing the commission for Virgin Records. Size is 388mm X 260mm. 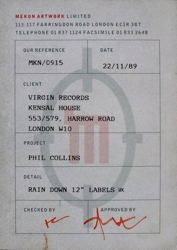 Phil Collins artwork/layout for the 12" labels for the 1989 E.P., "I Wish It Would Rain Down". 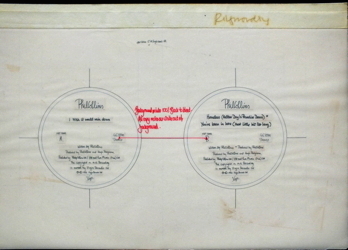 The layout comes with bottom paste-up layer and attached top layer with instructions for the printers. 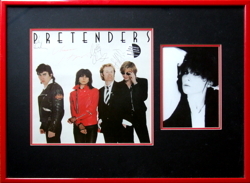 The Pretenders Framed and glazed first album from 1979, signed by the band before the untimely deaths of Pete Farndon and James Honeyman-Scott. Like many of the other items here, this was hanging on one of my walls before moving from my house in Scotland. 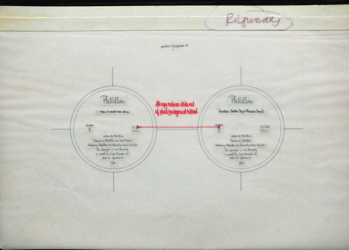 Roger Waters autographed cover for his 1984 album, "The Pros and Cons of Hitch Hiking." I had this framed and glazed in stunning matching colours for the main exhibition of Aberdeen's Alternative Festival in the early 1990s. Since then it's spent most of it's time hanging on a wall before it went nto storage some years ago after selling my home in Scotland. Size mm x mm. 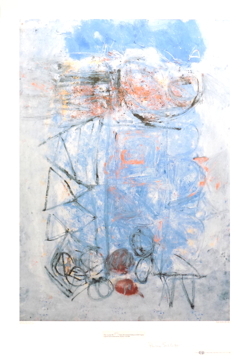 The two Stuart Sutcliffe prints below were originally purchased at the time of the first major exhibition recognising his talent. 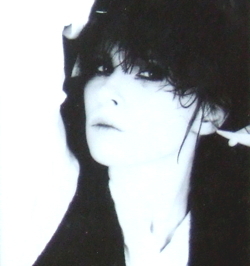 It was held at the Bluecoat Chambers in Liverpool in 1990. Both carry the wording © 1989 STUART 65 Westow Street, Crystal Palace, London, S.E. 19 01-771-1966. I have no details of the limited edition, whether it was of each print or of all the included prints. Strangely, I've also been unable to find these prints anywhere on the web. Stuart Sutcliffe Hamburg 1961 Cat. No. 1. 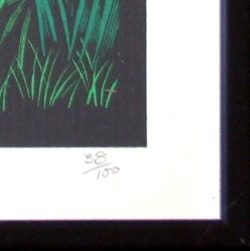 This is number 49 of the limited edition of 850 copies signed and numbered by Pauline Sutcliffe. Size 700mm x 900mm. Stuart Sutcliffe Hamburg 1961 Cat. No. 21. 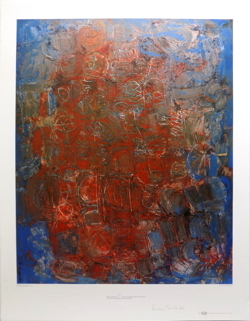 This is number 48 of the limited edition of 850 copies signed and numbered by Pauline Sutcliffe. Size 680mm x 980mm. 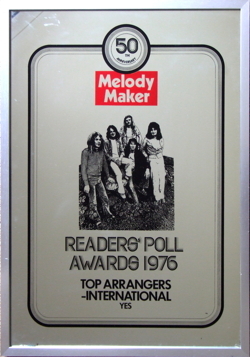 Yes Melody Maker Readers Poll Award 1976 for Top International Arrangers. These mirror awards very rarely come onto the market. 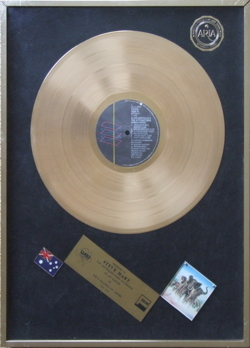 It features an image of the Patrick Moraz era group above the award category. 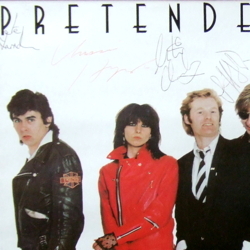 I bought this around 1988 when I was still doing Scottish record fairs. It came from a dealer based on the Black Isle who was more into beatnik and underground memorabilia and was clearing any prog items he had. As I said in the intro to this page, some items used to hang on my walls and this was one. 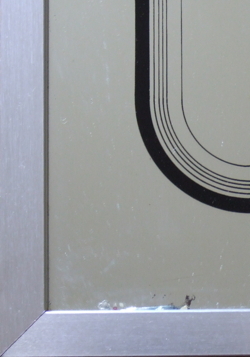 There are two very small cracks on the bottom edge, pictured in close-up on either side of the main pimage. Unfortunately, it was like this when I got it. Size mm X mm.